So here is my non-meat meal that even the carnivore loves. This serves between six to four depending on whether you put it with a side or the hunger of the individuals. I had six portions possible but the carnivore went back for seconds, and then an hour later thirds. This makes me think that it must be good, and better yet it is healthy. 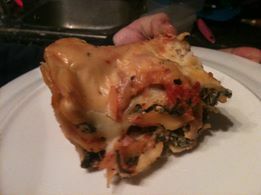 If you wanted this to serve more my suggestion would be to bulk it out with more spinach. The ricotta could be replaced really by any soft cheese, and Jamie Oliver does a recipe where he uses 60g cheddar instead of ricotta entirely. 3. Put half the tomato mixture into a oven dish cover with lasagne sheets then add half the ricotta mixture and cover with lasagne sheets. 5. At this point you can either put a white sauce over the top OR if you reserve some of the tomato mixture put that on top. 6. Put in the oven at 180c for 25-30 minutes. And see if it is golden yet. The ricotta is currently on offer at tesco though in a 3 for 2, so it is possible to save a further 33p if you would use it all up, or the other cheeses on offer. Incidentally this meal split between four has less than 400 calories in it so is a good slimming food that will make you feel full. ← My two week meal plan. This looks delicious! I’ll definitely give it a go.